SILVER DEMAND from the solar energy industry is set to drop by as much as 40% worldwide by the mid-2020s according to a new report, writes Atsuko Whitehouse at BullionVault. 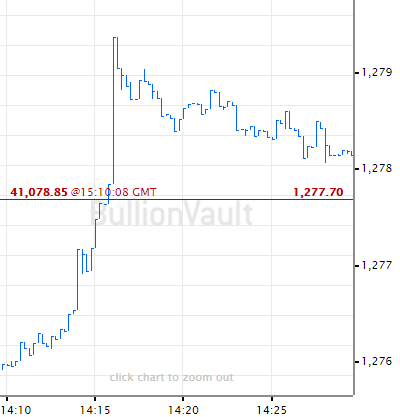 When silver prices more than doubled inside two years to trade near record highs at $50 per ounce in spring 2011, "the amount of silver in the average PV cell halved from 4.0g to 2.5g," the consultancy explains. The pace of thrifting then slowed as silver prices fell from $31 to $17 per ounce between 2012 and 2017, but the quantity of metal used per PV cell halved over that 5-year period says CRU's report. Growing to account for almost one ounce in every six used by industry today, silver demand for PV cells set a new record in 2017 according to analysts Thomson Reuters GFMS, rising 19% from the previous year to reach 94.1 million ounces (2,926 tonnes). This growth, GFMS says, was largely due to the ongoing boom in China's solar energy industry. Installations in China rose 55% per year in 2017 versus 24% for the world as a whole. 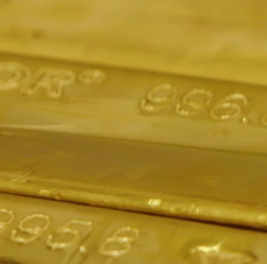 "Silver demand could fall if Chinese solar installations decline," said Heraeus, a leading German precious metals refiner and technology company, in a recent report. "If global solar installations drop by 10 GW, this implies a reduction of a little under 10 Moz in industrial silver demand, equivalent to around 1% of total global silver demand." 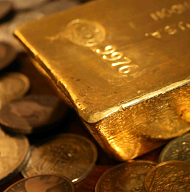 New installations in China will fall from 53GW in 2017 to approximately 45GW this year according to another leading precious metal consultancy, Metals Focus. It points to Beijing's reduction of Feed-In Tariff (FIT) payments, a government scheme paying subsidies to small-scale renewable and low-carbon electricity generation. US installations will meantime suffer from President Trump invoking Section 201 of the Trade Act of 1974, imposing new trade tariffs on imported PV cells and modules as a "safeguard" to protect US businesses, and hurting the pace of domestic solar energy growth from 2018 to 2021. India will see uncertainty stemming from its own "safeguard" duty, Metals Focus says, expected to cut the country's solar panel installation by one-third in 2018 from last year's level of 9.2 GW. Even though the price of silver looks "unlikely to rebound to the record-high levels reached in 2011," CRU says, the push for more efficient use of silver will now continue, because the PV industry has become such a "highly competitive market in which prices are consistently being driven down." 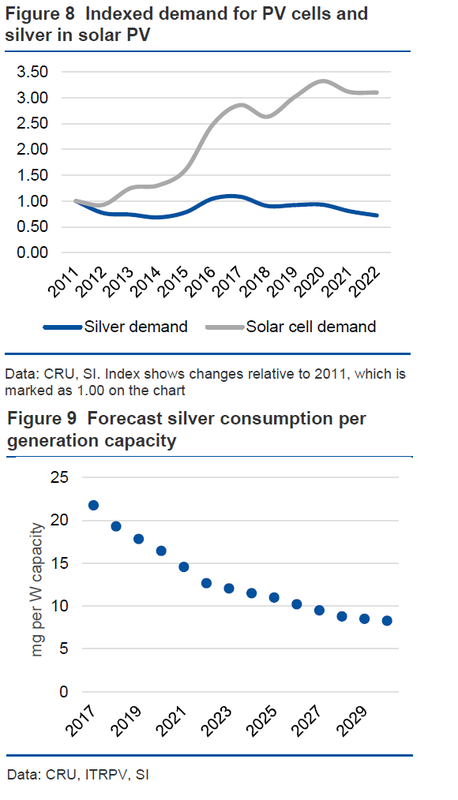 Plugging the gap in silver demand left by solar's declining use, electric vehicles and other transport demand will grow sharply CRU forecasts, rising some 70% to reach almost 70 Moz by 2030.